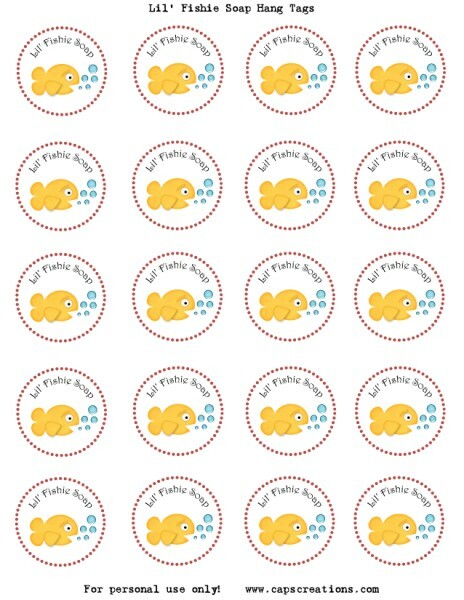 I have for you some free printable fishie tags, that we used for the Fish in a Bag Soap! They should print a full 8.5 x 11 sheet. Let me know if it works out for you? Click HERE or on the image below to download. If you use them I'd love to see your finished product! Please come back and share! eighteen 25 offers free downloads with just a link. Maybe you could ask them how they do it? What a cute download. I love it! Thanks for sharing at 'Look at me, I'm SO Crafty!' at Fun to Craft. Fixed it! You should be able to get it now. Thanks for letting me know. Download isn't working :( These are awesome favors! Does this download not work anymore? Ive created these soaps as a favour at my daughters birthday party would love to be able to use these tags? @Kirsty Hello, I've updated the link and it should work now. I'd love to see what y'all create with these tags. Please come back and share!